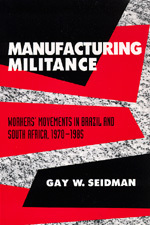 Challenging prevailing theories of development and labor, Gay Seidman's controversial study explores how highly politicized labor movements could arise simultaneously in Brazil and South Africa, two starkly different societies. Beginning with the 1960s, Seidman shows how both authoritarian states promoted specific rapid-industrialization strategies, in the process reshaping the working class and altering relationships between business and the state. When economic growth slowed in the 1970s, workers in these countries challenged social and political repression; by the mid-1980s, they had become major voices in the transition from authoritarian rule. Based in factories and working-class communities, these movements enjoyed broad support as they fought for improved social services, land reform, expanding electoral participation, and racial integration. In Brazil, Seidman takes us from the shopfloor, where disenfranchized workers organized for better wages and working conditions, to the strikes and protests that spread to local communities. Similar demands for radical change emerged in South Africa, where community groups in black townships joined organized labor in a challenge to minority rule that linked class consciousness to racial oppression. Seidman details the complex dynamics of these militant movements and develops a broad analysis of how newly industrializing countries shape the opportunities for labor to express demands. Her work will be welcomed by those interested in labor studies, social theory, and the politics of newly industrializing regions. Gay Seidman is Assistant Professor of Sociology at the University of Wisconsin, Madison.